The Jack Hart Mysteries are legal thrillers set in 1990s Seattle. I'm an attorney who began my career in Seattle during the mid-1990s. I wrote the novels to entertain my mom, sending them home chapter by chapter for feedback and critique. I got the idea for "Dead Weight" as I was walking to work on a blustery day - around the time that I had lost a little weight. Road repair and ambitious skateboarders pushed me close to the railing of the overpass - and the three-story drop to the freeway below. Someone said, "Don't jump!" right next to me. I couldn't tell if it was a warning or a joke. By the time I got to work, I had the first line of a Jack Hart Mystery I had not planned on writing, the only book of the series without "Good" in the title: "A woman doesn't kill herself when she's losing weight." 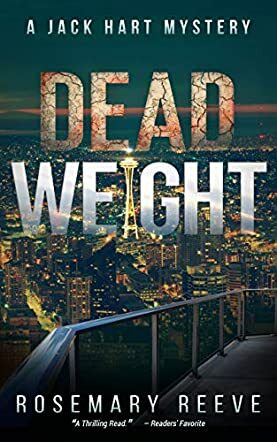 Dead Weight by Rosemary Reeve is the fourth Jack Hart Mystery. An apparently happy woman is dead and her life insurance company won't pay out. They say it was suicide and Jack Hart is defending them. His investigation takes him far and wide across Seattle where he learns that the woman was quiet, almost unnoticed wherever she went. In the six months before her death, she lost 50 lbs. – not the sort of woman to kill herself, surely? A woman whom nobody notices – did she overhear something she wasn't meant to? Something that could possibly put her in the line of sight of a killer? Was it an accident or did she commit suicide? There’s only one way to find out. Dead Weight by Rosemary Reeve is a thrilling read. I haven’t read any other Jack Hart mysteries but I will be now! This is a legal mystery with a lot of private detective action in it. The plot is multi-faceted but Rosemary has managed each separate part very well, tying everything up neatly at the end. There is action aplenty, it’s really well paced and there’s even a bit of humor scattered throughout. This is the kind of writing that draws you in and holds on tight until the story is done, with plenty of hooks to keep you reading. I loved the characters, which are really well developed and likable. The plot is entirely credible; it’s clean and it marches along at the right pace for the story, with no dead ends, no fluff. Highly recommended for anyone who loves legal mysteries with a good dose of humor and a great plot.